Following on from Part 1, the next stage is to explain how the BBC Micro actually interfaces with the organ to control the notes. The diagram of a sample latching circuit is shown below – there are 4 latches per chip, but there are only two clock lines, each one clocking two latches. 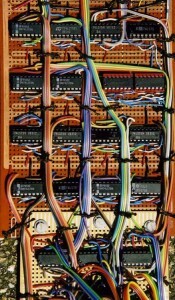 A single 1-0-1 clock pulse is then routed to one latch pair only, using a 2-to-4 74LS139 decoder and a series of 1-to-16 74L154 demux chips, as shown. 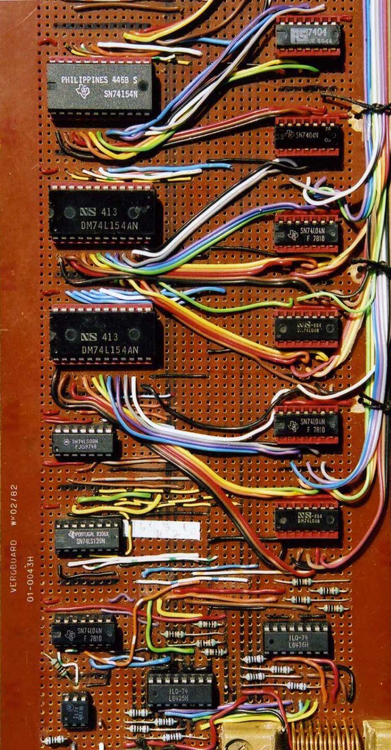 This arrangement requires 5 address bits as well as the two data bits and one clock bit. Each of the 32 5-bit addresses points to a pair of latches, so giving access to a maximum of 64 individual latches. There are only 54 notes on the manual organ, but some of the spare latches are used for auxiliary functions, including the operation of the master switching transistors in th 14V supply to upper and lower halves of the analogue switching board. Much of the above hardware is duplicated to provide independent operation of the 30-note pedal organ, but this needs only one additional address line to distinguish between the two sections. 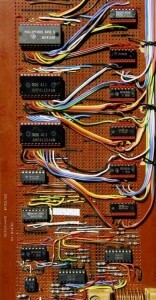 Operation of the above hardware is controlled by a machine code program running on the BBC Micro. A user interface in BBC BASIC, normally running in MODE 6, controls the display, selection and loading of items from the music menu. Prior to the transfer of control to the machine code there is provision for setting a number of playing parameters, whose values are passed via the Resident Integer Variables. For more details, see Part 1 (Intro) and Part 3 (Generating The Data). 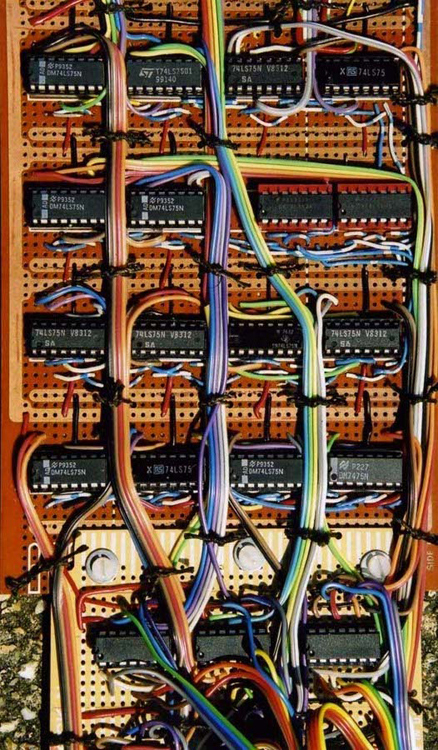 This entry was posted in barCamps, geekery, technology and tagged bbc micro, geoff king, hardware hack, pipe organ. Bookmark the permalink.